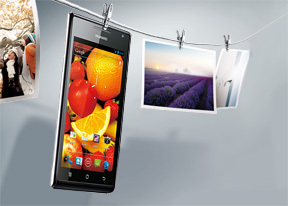 The Huawei Ascend P1 comes with Polaris Office, which handles document editing with ease. It supports Word, Excel and PowerPoint docs (both the 2003 and 2007 versions), it opens PDF files and it doubles as a file explorer. When editing a document, you get plenty of options - from text size and formatting to text justification, lists, tables, an Excel formula editor and more. You do get a proper file explorer too - it has three tabs, the first of which organizes files by type (e.g. audio, video, documents and so on), while the other two handle the internal and external storage organized by folders. The app can do all basic stuff that's expected of a file explorer, but it also opens and creates ZIP files. It supports batch operations too. The calendar features four views - Daily, Weekly, Monthly and Agenda. The app can easily handle several online calendars as well as the local calendar. You can add multiple reminders for each event and search through all events. A very useful app is Security guard. One of its features is blacklist - you can add phone numbers to that list (from the phonebook, call log or the list of received messages) and calls and texts from that number will be blocked. There's a white list too. Other features of the Security guard include encrypting and decrypting files and storing your passwords. Be warned that encrypted files are stored into a proprietary .HWE format and might not be compatible with other tools. The Clock app defaults to a desk clock mode that looks a lot like the lockscreen and you can turn the light almost all the way down to enter a power-efficient mode with a single tap. The usual alarm functionality is there - you can set multiple alarms, each with its own repeat time, ringtone and label. You also get a basic Notes app and a Sound recorder. There's a Weather clock app too, which offers weather info for multiple cities complete with beautiful animations. The good old calculator is here too - it has big, easily thumbable keys and you can swipe to the left to bring up the advanced functions (trigonometry, square root, brackets, etc.). Finally, there's the flashlight app. The interface is essentially a 3D rendition of a flashlight and it lights up the LED flash at one of three power levels. The Huawei Ascend P1 features a built-in GPS receiver that takes a couple of minutes to get a lock. You can use A-GPS to speed that up or go for Cell-ID and Wi-Fi positioning for a rough lock (all three options however require an Internet connection). Google Maps is onboard and offers the same functionality but with some changes to its interface. The top band features a dropdown that makes it easy to switch between several different modes - Maps, Places, Navigation, Check in, Latitude, Location history and My places. The bottom bar uses shortcuts for searching, planning a route, searching near you, selecting which layers are visible and getting into the Settings menu. The app uses very data-efficient vector maps, which have the added bonus of letting you control the viewing point with two fingers (pinching for zooming, rotating for turning the camera and sliding for tilt control). 3D buildings are also available in some regions. Street view and Search nearby are available as always. You can use Maps to plan pedestrian and car routes or routes with public transport. Some regions get to use Google Maps Navigation that does voice-guided navigation. It needs a data connection when you first create the route, but after that you can go offline (it will even recalculate the route if you go off course). Google has announced that they will be releasing an update that will fully enable offline operation too. The Google Play Store is organized in a few scrollable tabs - categories, featured, top paid, top free, top grossing, top new paid, top new free and trending. The in-app section is very informative - a description, latest changes, number of downloads and comments with rating. There is usually a demo video and several screenshots for most apps too.